The Scarce blue-tailed is a small species of damselfly. Found flying in low vegetation at flushes and pools. The males are mostly black, like the Blue-tailed, but segment 9 is predominantly blue rather than segment 8, as in Blue-tailed. They emerge in late May, peaking in June but continuing through to September. The specific habitat requirements have prevented widespread colonisation and the species is confined to shallow water conditions with little vegetation. Habitat disturbance is a key factor in maintaining populations. 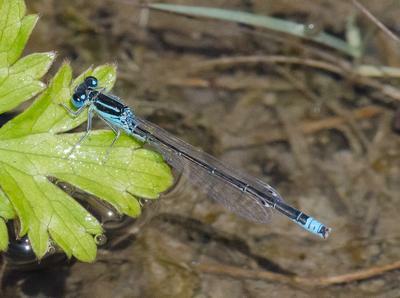 For more information see the British Dragonfly Society Scarce blue-tailed damselfly page.